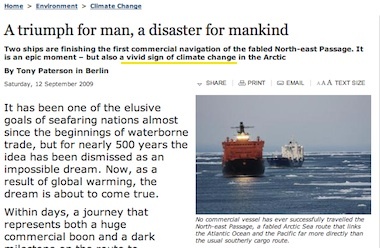 One of Russia's commercial maritime trade routes for the past 70 years has been "re-opened" by a press hungry for dramatic Global Warming scare stories - but who failed to check the most basic facts. I've traced this fascinating example of "eco-churnalism" - peddled by both BBC Radio and its website, the Daily Mail, The Independent, Reuters and many others - back to its origins, with a press release from a German shipping group. But first of all - what on Earth is the Northern Passage? Also called the Northeast Passage or North Sea Passage, it's a trade route that in summer months links the North European and Siberian ports to Asia, around the Arctic Circle. Orient-bound traffic heads east, then South via the Bering Strait. The route offers significant gains over the alternatives via Suez or the Cape, it's shorter, quicker and cheaper. But until technological advances in the early 20th Century it was considered too hazardous for commercial operation. Since the 1930s the route has seen major ports spring up, carrying over 200,000 tons of freight passing through each year, although this declined with the fall of the Soviet Union. But none of this ever happened, we learned on Saturday. The Independent reported that the journey had been traversed for the very first time, proclaiming that two German ships had completed "the first commercial navigation of the fabled North-east Passage", proclaiming it "a triumph for man, a disaster for mankind". BBC Radio followed suit. Others have followed the BBC. It didn't take long to trace the origin of the story. On Wednesday, German shipping group Beluga claimed "the first non-Russian commercial vessels to make it through the Northeast Passage from Asia to Europe". You can still read their press release, here. Journalists failed to challenge Beluga's claim that the Northeastern Passage was "formerly impenetrable", but bloggers had debunked it within seconds. North unearthed a fascinating account of the past 80 years of this sea route (pdf, 17pg) by a retired mariner Jan Drent, who made the Europe to Asia Northeast Passage himself. Drent writes that the Soviet Union offered to open the route to global commerce in 1967, but with war in the Middle East closing the Suez, Russia didn't want to offend its Arab allies. In their haste to bring us Thermageddon, journalists now simply manufacture the evidence. But wasn't the recent warming period - which started began in the mid-1970s and with temperatures peaking in the late-1990s - a contributory factor? Arctic Ice has recovered the past couple of years, but it's still down on 30 years ago. As it happens, the thaw has helped, but isn't the primary reason, according to maritime historians. "In the past ten years voyages between the northern coast and Japan and Canada have demonstrated how modern ice-strengthened vessels and contemporary ice forecasting have extended the navigation season." Andrew warmly welcomes your mail. Bootnote: An earlier version of this article put much of Siberia's Northern coastline outside the Arctic Circle. Unfortunately for Siberians, it's not.